How do you stop consumers scrolling past mobile ads? 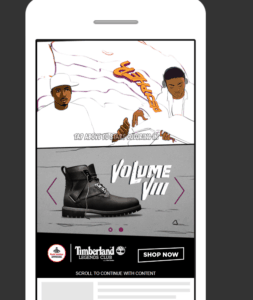 That's the pressing industry question outdoor footwear and apparel manufacturer Timberland found an answer for in a recent mobile campaign, featuring hip-hop icon Nas and an interactive "coloring book". It was in the nineties when hip-hop artists like Nas started donning Timberland's iconic Yellow Boot, giving the footwear mass street cred, and soon earning Timberland a place at very fore of US pop culture. And it was this reputation that the brand wanted to push in creative and interactive ways with a mobile advertising campaign that ran at the end of last year. Nas has been a respected hip-hop artist for nearly three decades. He's also a Timberland loyalist, frequently calling out the brand by name in his rap lyrics, which made him the ideal collaborator for the brand to work with. Named "Timberland Legends Club", the campaign first launched in September last year with its own website - in partnership with shoe retailer Foot Locker - and consisted of four new design variants of Timberland's iconic boot, which had their respective releases staggered over the three months (from September to December 2017) of the campaign's duration. One of the most eye-catching elements of the campaign was a four-part series of animated shorts - dubbed "The Legend Continues" - which told the story of Nas's rise to fame. Featuring striking color animation - as well as narration by the man himself - The Legend Continues series took viewers on a journey from Nas's days as a kid on the streets of Brooklyn, right up to when he got his big break in his first studio session. Each episode featured and coincided with the release of each of the four new boots. "As we dove headfirst into tackling the art and storytelling within these films for Timberland's Legends Club, we knew we were creating something that was as much lifestyle as it was product," writes the creative agency responsible for the animations, Gentleman Scholar. "It's a snapshot of history. Stories that shed light on one of the greatest lyrical geniuses of our generation. We, all of a sudden, had to channel the feeling of Nas's life, his journey, his stories in an engaging set of animated films. The campaign's foundation became the stylized imagery we created, full of pops of color and cel-animated, liquid transitions." Timberland wanted to make sure its Legends Club campaign reached as many people in its target group - young people and millennials - as possible, and knew that mobile ads were the best way to do it. However, fully aware of people's tendency to mindlessly thumb past ads as they scroll through their feeds on mobile, the company decided to introduce an interactive element that made the ads completely different from anything else on offer - and a whole lot more engaging. The result was an interactive "coloring book", once again featuring the star of the show, Nas. 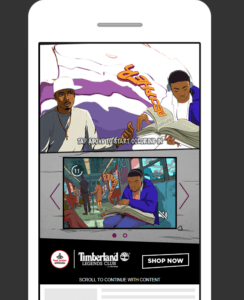 The mobile ad featured a mural of the rapper, which fans could color in by tapping on the various parts of the image, while the latest episode of "The Legend Continues" played underneath - ensuring people stayed on the ad long enough to see the video. The goal for Timberland's new mobile ad campaign was to be so engaging and eye-catching that consumers would not scroll past it. During the seven weeks this part of the campaign ran for, 230,000 consumers interacted with the ad in some way - either via watching the video or coloring in the mural - which equated to an 8.67% engagement rate. This is about 333% higher than the average engagement rate, according to Timberland. The net result was that 45% of consumers who engaged with the coloring book mobile ads watched the entire video from start to finish - a fantastic result indeed. Mobile ads have great potential for brands who want to reach a young and/or tech savvy audience - but ensuring people stop scrolling for long enough to engage with the content can be a challenge. With its interactive Legends Club coloring book campaign, Timberland delivered a creative solution with outstanding results. You can hear Timberland's Manager of Site Experience and Mobile, Brandon Zambroski, speak at Mobile Next 2018 this September at the Omni Rancho Las Palmas, in Rancho Mirage, CA.